This insanely delicious Grilled Broccoli Caesar Salad is fun and summery take on our fav salad recipe. 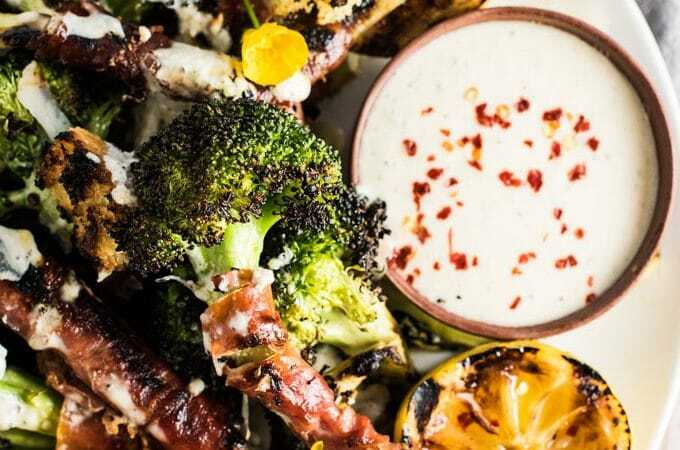 The broccoli is wrapped in salty prosciutto that turns crispy when grilled. The dressing is an easy to make and lightened up (read: healthy!) version made with yogurt. You will LOVE this! This DELISH salad recipe is kicking off a fun new series here this month! We're heading outside and firing up the grill. This is all about making the best of summer cooking. 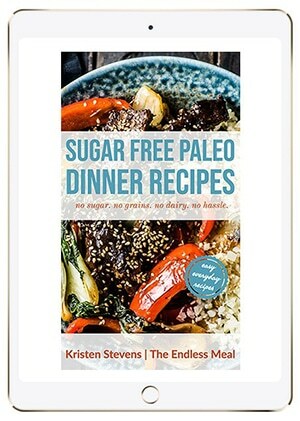 Remember when we did the Month of Whole30 Recipes? It got me thinking that by limiting the kinds of recipes I make for you guys, I could get more creative. It's a bit counterintuitive, but cooking within limits can be really fun. Here's the truth: I'm not some big shot, fancy grill master. But I am a girl who loves to light the BBQ and pretend I know what I'm doing. Luckily for me, grilling isn't exactly rocket science. So what if you don't have a grill? Don't worry, you'll be able to make most of the recipes in this series (like this Broccoli Caesar Salad) but roasting them in your oven. I'll note which recipes are oven-friendly. This broccoli Caesar salad is loosely based on a traditional Caesar. I almost want to call it a deconstructed Caesar salad, but that sounds a little too fancy pants for me. 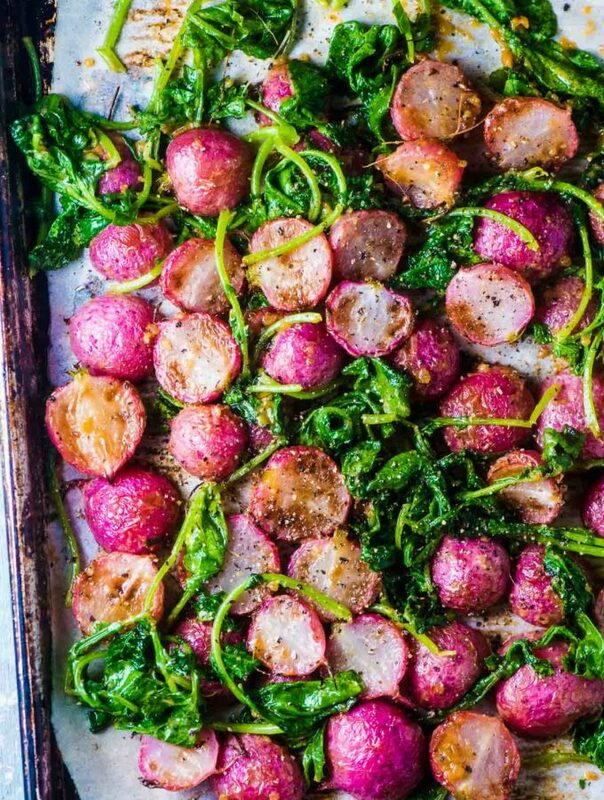 While this would be a gorgeous dish to include in your summer dinner party menu, it's also easy and casual enough to make during the week. Sidebar → Are Caesar salads not the best ever, or what? I swear they've been holding strong since the 80s and don't show any sign of stopping. Either that or I've had my face deep in the Caesar bowl and didn't notice the trend has passed. I'm a little worried now about which one is the truth. ? Obvs I've swapped the romaine lettuce for broccoli. 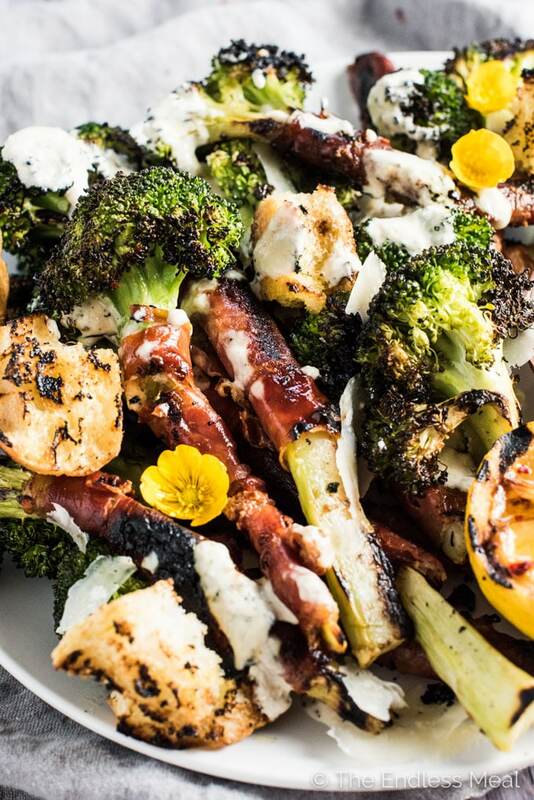 While broccoli isn't exactly lettuce-like, it is extra delish when the tops get crispy charred. Serious goodness here! Then there's the prosciutto. Honestly, this whole dish is all about the prosciutto. Caesar salad almost always has bacon in it, and I didn't think it was fair to leave that salty deliciousness out of a broccoli Caesar salad. Instead of bacon, I've used its grown-up cousin, prosciutto, in this recipe. 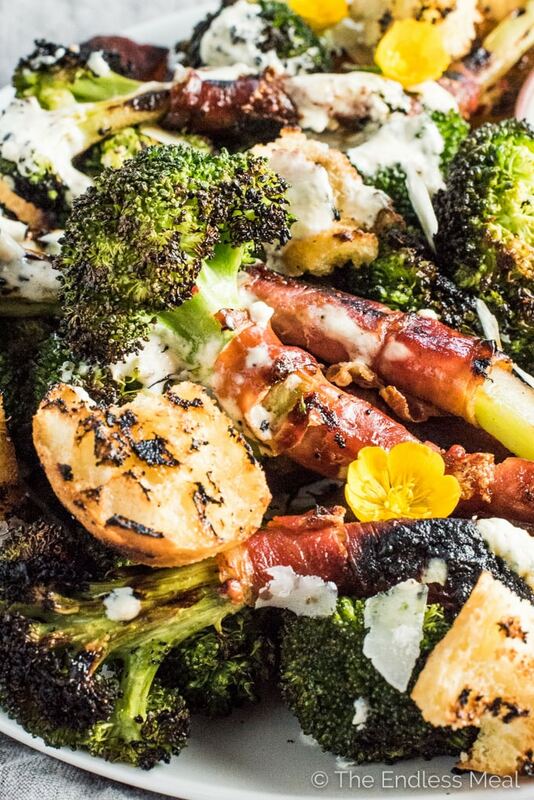 By wrapping the prosciutto around the broccoli stems and then grilling it, you get crispy prosciutto that is seriously out of this world. Also … broccoli stems. Can we all get together and stop throwing them out? When and why did we start doing that anyway? It must be a throwback to before the days we were savvy on food waste. Funny how old habits die hard. Honestly, I still struggle to not automatically cut off the stem and throw it in the compost. If you've been chucking the stems because that's what you've always done, try leaving them on and cutting them into long strips like in the pictures here. 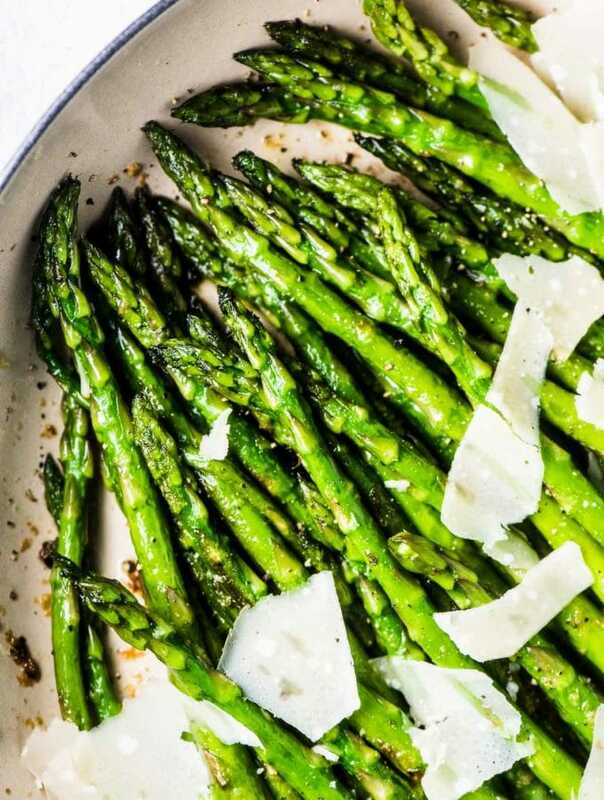 They're the sweetest part of the broccoli and make a great poor man's broccolini! Traditional Caesar dressing is made from an egg yolk and oil emulsification that is similar to mayo. While it's super easy to do, it can feel intimidating if you've never done it before. There's also the whole issue/ non-issue of raw eggs. For me, it's a total non-issue. I've been licking cake batter from the bowl, munching on raw cookie dough, and dragging my fries through an embarrassingly large mountain of homemade mayo since basically I was born. I ate raw dough when I was pregnant and now share the batter covered beaters with my little girl. I've read the stats and feel totally comfortable with the teeny tiny, almost non-existent chance that I might come in contact with salmonella. Maybe I'm a weirdo. But … I know that some people feel very differently than I do. Maybe you do? I'm here to say, that's ok! There's no judgment here, just a super simple substitute for the traditional raw egg dressing. ? It's important that we all do what works best for us. What we feel comfortable with. And let's be honest, even if you have no prob with raw eggs, it's easier to mix some parmesan, lemon, and garlic into yogurt and call it Caesar salad dressing. The thing that surprised me the most about this dressing is how similar it is to the real thing. It's definitely lighter, but I think that's a bonus. There's lots of lemon and garlic and a ton of flavor from the parmesan cheese. It's become my go-to easy Caesar salad dressing recipe. Place the cubed bread in a medium-sized bowl. Drizzle with the remaining teaspoon of oil and the salt and toss to coat. Oil your grill and preheat to high. While the grill is heating, mix all the Yogurt Caesar Dressing ingredients together in a medium-sized bowl. Season to taste with salt and pepper. Grill the bread until grill marks appear on all sides. Lower the heat to medium-high and add the prosciutto wrapped broccoli. Grill, turning a few times, until the prosciutto is crispy, the broccoli is tender, and there are a few grill marks on the broccoli tops, about 7-8 minutes. 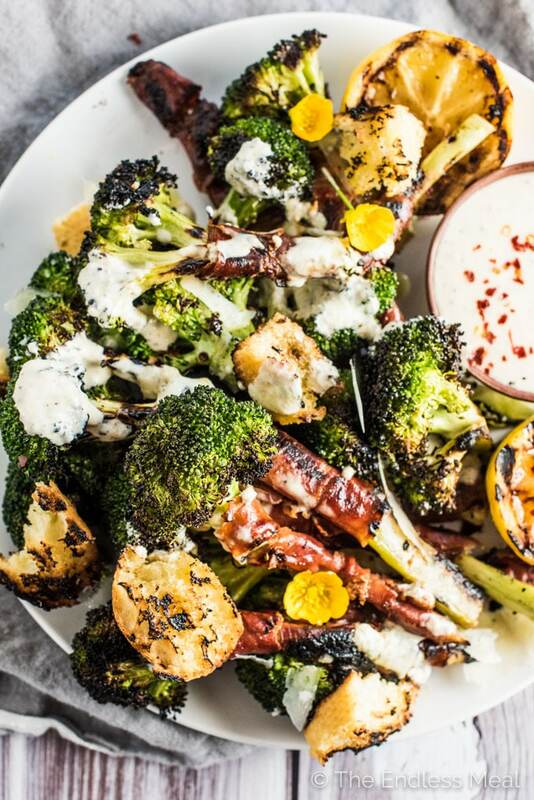 Plate the grilled broccoli and drizzle with the dressing. Top with the croutons and some extra parmesan cheese. The amount of oil in the recipe is conservative. Feel free to drizzle the croutons and broccoli liberally with oil. Just don't use less than what the recipe calls for! If you don't have a BBQ, you can roast the broccoli in your oven for about 25-30 minutes at 400 degrees. Um, Kristen? I have something to tell you…. I’m kind of obsessed with you! Seriously, girl, this salad a) is genius and b) looks unbelievable. Prosciutto-wrapped broccoli?! Come on! Oh, and I’m not weird about the salmonella deal, either, but then again when I was prego o would eat plates and plates of salmon sashimi, ha! So happy to hear I’m not the only one who thinks that way. I also ate a ton of sashimi when I was pregnant and didn’t worry about it at all. It’s so good!